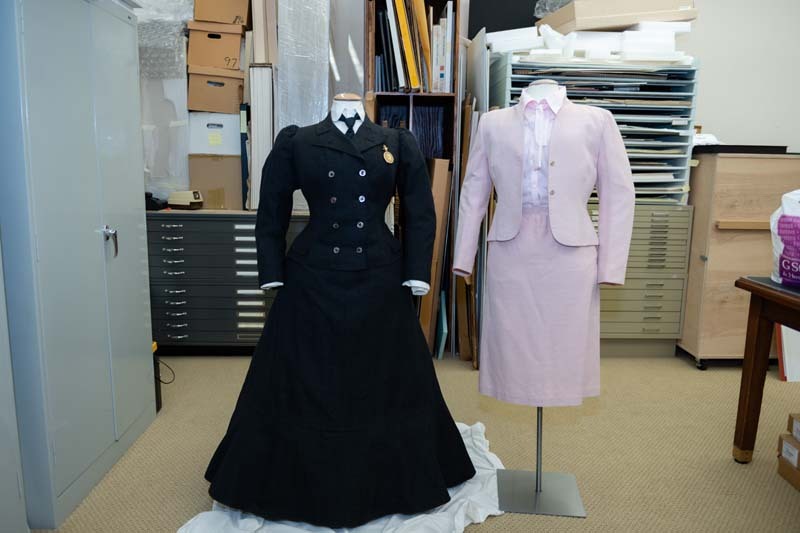 In July, I had the great privilege and fun of going to the Supreme Court building to dress two manikins for their current exhibit, “In Re Lady Lawyers: The Rise of Women Attorneys and the Supreme Court,” which is open to the public through 2020. The exhibit takes its title from the early 20th century list of women admitted to argue before the Supreme Court, which was kept by an employee in the Office of the Clerk. Exhibitions Coordinator Maya Foo contacted me about a year ago to ask whether we had anything in the DAR Museum collection we could lend for the exhibit. 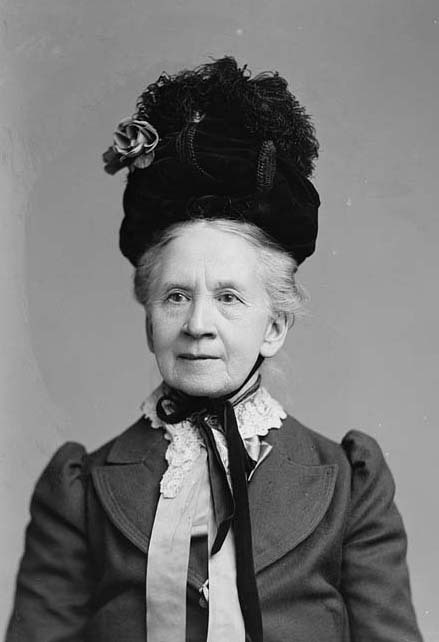 She wanted to represent Belva Lockwood, the first woman lawyer to argue a case before the Supreme Court. 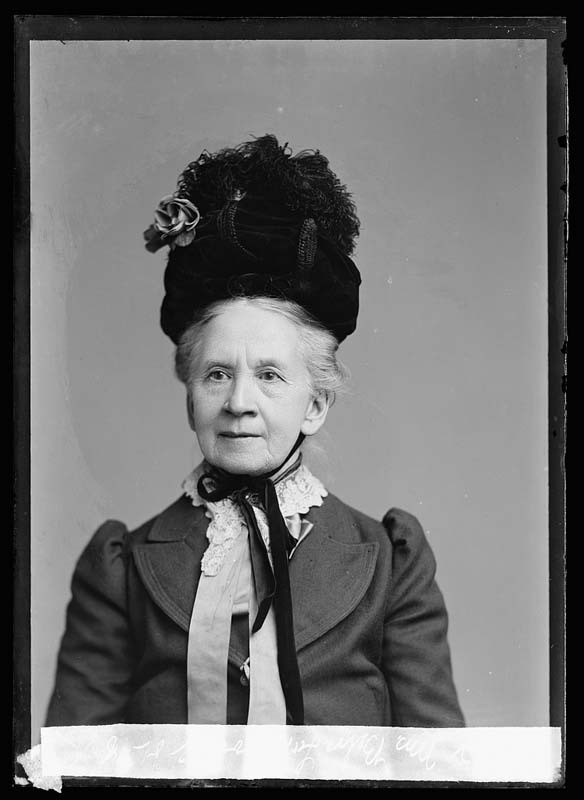 Mrs. Lockwood was also a civil rights activist and suffragist. 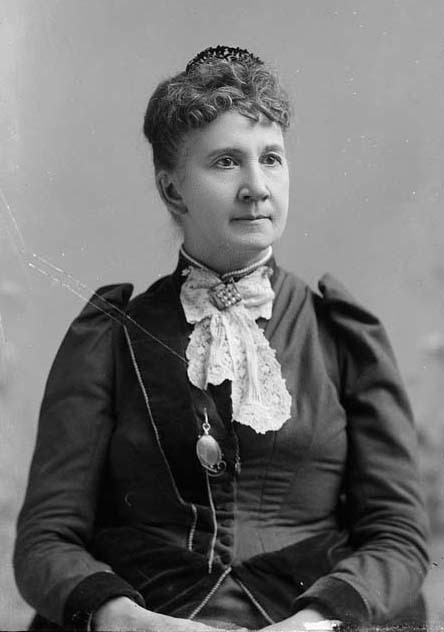 She ran for President of the United States on the National Equal Rights Party’s ticket in 1884 and 1888—despite the fact that women did not even have the vote. And as many of you may know, she was a DAR member. Here’s a photo of her in 1891. 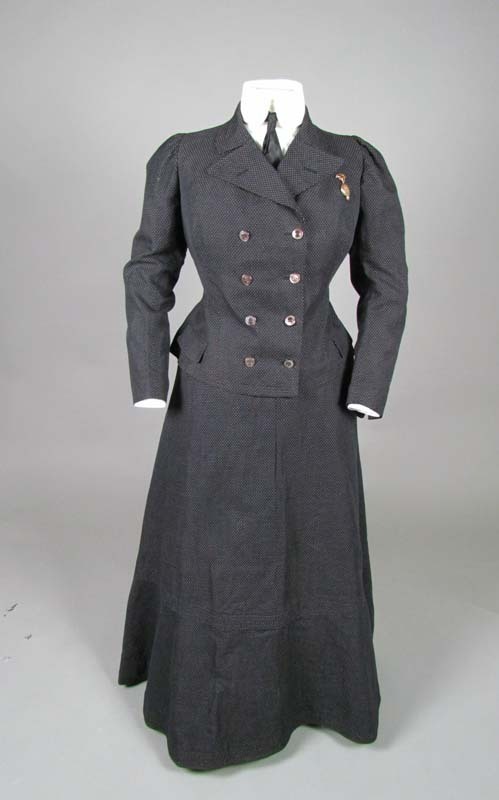 While we do not have any clothes worn by Lockwood herself, we do have a woman’s suit from just about the time of her 1906 case, which represents the typical business attire for women of the era. Just like women in the 1970s when they entered the professional workforce in large numbers, women at the turn of the 20th century adapted men’s suits to women’s bodies, incorporating details of contemporary women’s fashion. 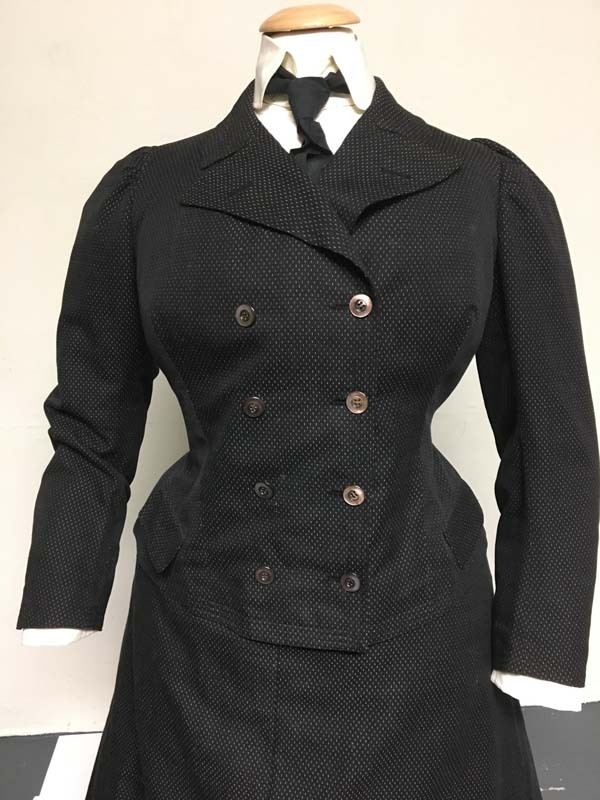 This suit is made of sturdy black cotton with a white pinstripe-like weave, and the jacket follows the curves of the woman’s body as shaped by the corset of its day. 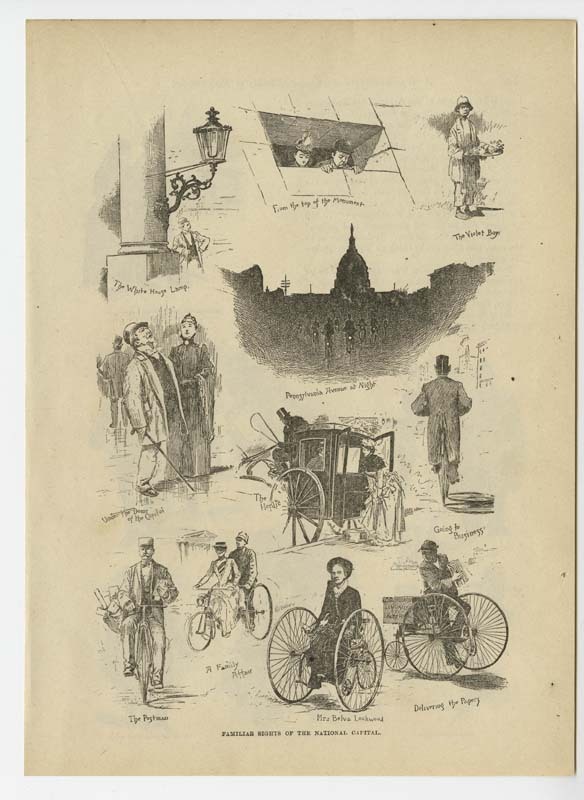 Its sleeves have just a little of the fullness stylish at the time, and of course the skirt is long, but not quite floor length—slightly more practical for walking city streets. 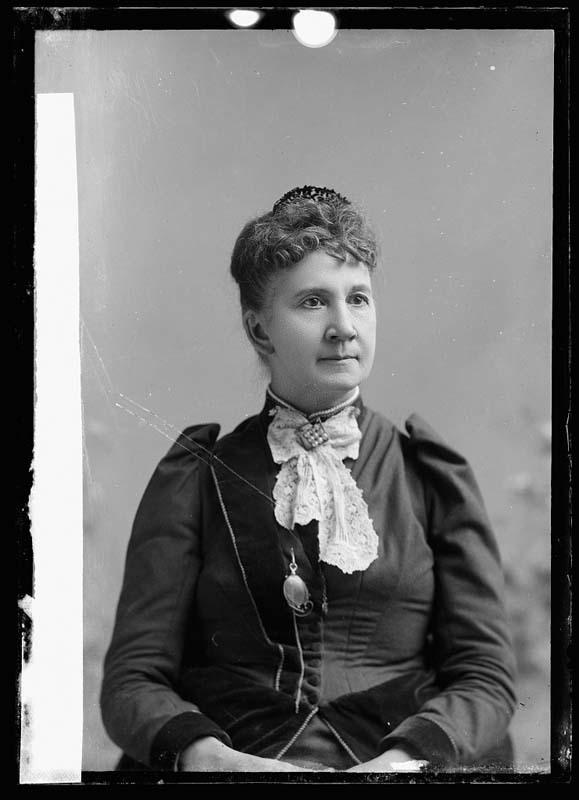 This photo of Lockwood in 1903 shows her wearing a wool suit quite, from what we can see, like the suit we lent to represent her—although we did not add a lace collar or a perky hat. We did, however, add a locket like the one in her 1891 photo. 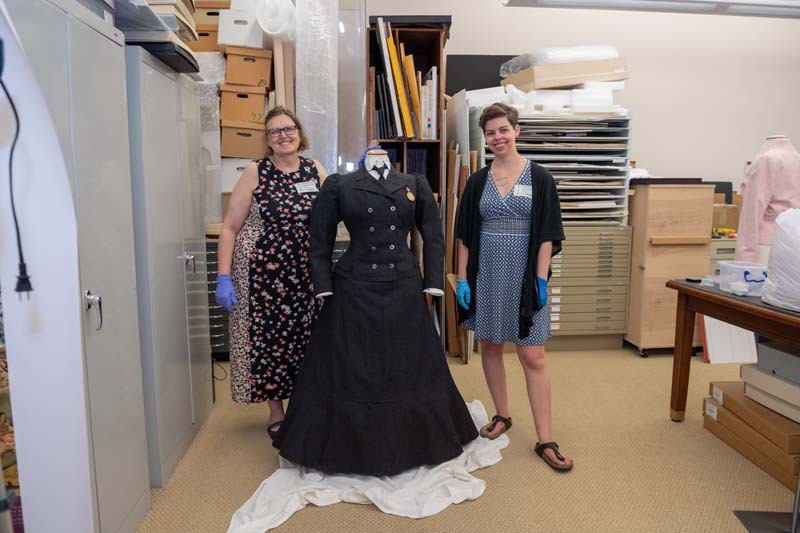 With the help of Alison Polivka, who assisted with the DAR Museum’s “Agreeable Tyrant” costume exhibit and who has a Master of Arts in Museum Studies, I dressed the manikin with the petticoats and padding it as needed. We then packed the suit in an acid-free box and brought it, with the petticoat-clad manikin form, over to the Supreme Court. Upon our arrival to the Court, Supreme Court Police Officers were a bit curious about our half-dressed manikin and its many petticoats. We also brought a second manikin with us, to dress Justice Sandra Day O’Connor’s pink suit, which is part of the Supreme Court’s collection. This is the suit she wore when President Reagan announced her nomination to the Court in 1981. What an honor to be handling this very personal artifact from a turning point in women’s history! I think it’s interesting that it’s pink—a very traditional, feminine color—not like the dark suit of 1905, and not like so many of the suits women wore in law offices in 1981, either. There are any number of ways to interpret that, but we don’t know what was in Justice O’Connor’s mind when she chose it for the Rose Garden press conference. The Supreme Court’s photographer kindly took some pictures of our work. Just visible on the table in this picture of the two suits is our “bag of tricks” for last-minute tweaks: quilt batting, tulle, acid-free paper, needle and thread, pins and twill tape—you never know what you might have to do to the petticoats or underpinnings to create the right silhouette for the period and support the skirt. The exhibit is now installed—and open to the public—on the ground floor of the Supreme Court building on Capitol Hill here in Washington. The suits are in glass cases facing each other, with other artifacts including one of Justice Ginsburg’s notorious jabots, as well as artifacts belonging to Justices O’Connor, Kagan, and Sotomayor. There are photos and labels discussing the history of women arguing before, and more recently sitting on, the Supreme Court Bench. The DAR Museum was proud to be asked to be part of this exhibit. It was certainly a highlight of my year to go there and work for an afternoon behind the scenes. All photos taken in the Supreme Court building are courtesy of the Supreme Court of the United States. You can find out more about the exhibit, including opening hours, here: https://www.supremecourt.gov/visiting/RiseOfWomenAttorneys.aspx. It will be up for about two years, so if you are here for any reason including the next two Continental Congresses, you can head over and see it. The Supreme Court building is fascinating to visit in any case, with exhibits about the history of the Court and its majestic building, whose interpretation of neoclassicism is extraordinarily beautiful—and when Court is not in session, you can often see the courtroom: https://www.supremecourt.gov/visiting/whatcaniseeanddo.aspx.